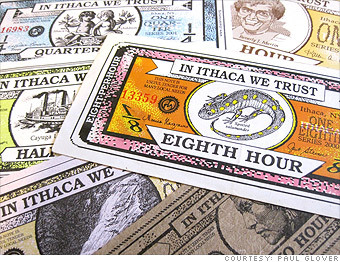 One of the longest-running community currencies in the United States, Ithaca Hours has been used as a model for many other homegrown currencies. Paul Glover, who has started 18 community organizations aimed at improving issues like education and housing in cities across the country, launched the currency back in 1991 to help stimulate the local economy. Now, more than 900 participants -- including both businesses and individuals -- currently accept Ithaca Hours for goods and services, and several employers issue the currency as part of their wages. "I realized there were many magnificent things that could be done to repair America but that these were frustrated by lack of dollars," said Glover. "So it occurred to me that if we were going to have enough money, we'd have to print it ourselves." Glover denominated the currency in "HOURS" to convey that it is really the time spent helping the community that is being exchanged. At the time, the average hourly wage in Tompkins County, NY was $10 an hour, so he set the exchange rate for one Ithaca Hour to 10 U.S. dollars, and it hasn't changed since. The currency also comes in 1/4-, 1/2-, 1-, 2-, and 4-hour denominations. The bills, which state "In Ithaca We Trust," feature local emblems like Lick Brook and the Cayuga Lake Steamboat.